Cosmetics are substances used to enhance or protect the appearance or odor of the human body. They include skin-care creams, lotions, powders, perfumes, lipsticks, fingernail and toenail polishes, eye and facial makeup, permanent waves, hair colors, hair sprays and gels, deodorants, baby products, bath oils, bubble baths, bath salts, butters and many other types of products. Their use is widespread, especially among women in Western countries. A subset of cosmetics is called "makeup," which refers primarily to colored products intended to alter the user’s appearance. The U.S. Food and Drug Administration (FDA), which regulates cosmetics in the United States, defines cosmetics as products "intended to be applied to the human body for cleansing, beautifying, promoting attractiveness, or altering the appearance without affecting the body's structure or functions." This broad definition includes any material intended for use as a component of a cosmetic product. The FDA specifically excludes soap from this particular category. An 1889 Henri de Toulouse-Lautrec painting of a woman applying cosmetics to her face. The history of cosmetics spans at least 6,000 years of human history, and almost every society on earth. In the Western world, the use of cosmetics became prominent in the Middle Ages, typically among members of the upper classes. Cosmetic use was frowned upon at some points in history. For example, in the nineteenth century, makeup was used primarily by prostitutes, and Queen Victoria publicly declared makeup improper, vulgar, and acceptable for use by actors only. Adolf Hitler told women that face painting was for clowns and not for the women of the Master Race. By the middle of the twentieth century, cosmetics were in widespread use in nearly all societies around the world. Egyptian cosmetics box from the Bronze Age. Henna has been used in India since around the fourth or fifth centuries. It is used either as a hair dye or in the art of mehndi, in which complex designs are painted on the hands and feet, especially during auspicious occasions such as a Hindu wedding. Henna is also used in some north African cultures. The use of kohl (or kajal) has a long history in Hindu culture. Traditional preparations of kohl on children and adults have been thought to have health benefits, but in the United States, it has been linked to lead poisoning and is prohibited. Chinese people began to stain their fingernails with gum arabic, gelatin, beeswax and egg from around 3000 B.C.E. The colors represented social class: Chou dynasty royals wore gold and silver; later royals wore black or red. The lower classes were forbidden to wear bright colors on their nails. 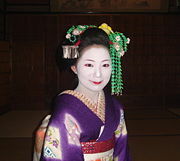 A maiko in the Gion district of Kyoto, Japan, in full makeup. The lipstick style indicates that she is still new. In Japan, geishas wore lipstick made of crushed safflower petals to paint the eyebrows and edges of the eyes as well as the lips. Sticks of bintsuke wax, a softer version of the sumo wrestlers' hair wax, were used by geisha as a makeup base. Rice powder colors the face and back; rouge contours the eye socket and defines the nose. Ohaguro (black paint) colors the teeth for the ceremony when maiko (apprentice geisha) graduate and become independent. 1889 painting Woman at her Toilette by Henri de Toulouse-Lautrec. During the Middle Ages, Renaissance, and up until the Industrial Revolution, the lower classes had to work outdoors, in agricultural jobs. The typically light-colored European skin was darkened by exposure to the Sun. The higher class a person was, the more leisure time he or she had to spend indoors, which kept the skin pale. Thus, people in the highest classes of European society, able to spend all their time protected from the Sun, frequently had the lightest-looking skin. As a result, European men and women often attempted to lighten their skin directly, or used white powder on their skin to look more aristocratic. A variety of products were used, including white lead paint that, as if the toxic lead wasn't bad enough, notoriously also contained arsenic. Some Native American tribes painted their faces for ceremonial events or battle. During the early years of the twentieth century, makeup became fashionable in the United States of America and Europe, partly because of the influence of ballet and theater stars such as Mathilde Kschessinska and Sarah Bernhardt. But the most influential new development was that of the movie industry in Hollywood. Among those who saw the opportunity for mass-market cosmetics were Max Factor, Sr., Elizabeth Arden, and Helena Rubinstein. Modern synthetic hair dye was invented in 1907 by Eugene Schueller, founder of L'Oréal. He also invented sunscreen in 1936. The flapper look came into fashion in the 1920s, promoting dark eyes, red lipstick, red nail polish, and the suntan, invented as a fashion statement by Coco Chanel. Earlier, suntans had been sported only by agricultural workers, while fashionable women kept their skins as pale as possible. In the wake of Chanel's adoption of the suntan, dozens of new fake tan products were produced to help both men and women achieve the "sun-kissed" look. In Asia, skin whitening continued to represent the ideal of beauty. The manufacture of cosmetics is currently dominated by a small number of multinational corporations that originated in the early twentieth century, but the distribution and sale of cosmetics is spread among a wide range of different businesses. The worldwide annual expenditures for cosmetics is estimated at U.S. $18 billion. Of the major firms, the oldest and the largest is L'Oréal, which was founded by Eugene Schueller in 1909 as the French Harmless Hair Colouring Company. The market was developed in the United States during the 1910s by Elizabeth Arden, Helena Rubinstein, and Max Factor. These firms were joined by Revlon just before World War II and Estée Lauder just after. 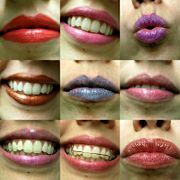 Lipstick, lip gloss, lip liner, lip plumper, lip balm, lip luster, lip conditioner and lip boosters. Foundation, used to color the face and conceal flaws to produce an impression of health and youth. Usually a liquid, cream, powder or mousse. Powder, or face illuminator used to set the foundation, giving a matte finish. Rouge, blush or blusher, cheek stain used to color the cheeks and emphasize the cheekbones. This comes in powder, cream and gel forms. Bronzer, used to create a more tanned or sun-kissed look. Eye liner and eye shadow, eye shimmer and glitter eye pencils as well as different color pencils used to color and emphasize the eyelids (larger eyes are a sign of youth). Eyebrow pencils, creams, waxes, gels and powders are used to fill in and define the brows. Concealer, a type of thick opaque makeup used to cover pimples, various spots and inconsistencies in the skin. Also included in the general category of cosmetics are skin care products. These include creams and lotions to moisturize the face and body, sunscreens to protect the skin from damaging UV radiation, and treatment products to repair or hide skin imperfections (acne, wrinkles, dark circles under eyes, etc.). Cosmetics can also be described by the form of the product, as well as the area for application. Cosmetics can be liquid or cream emulsions; powders, both pressed and loose; dispersions; and anhydrous creams or sticks. In addition to over-the-counter cosmetic products, recent years have seen an increasing market for prescription or surgical cosmetic procedures. These range from temporary enhancements, such as cosmetic colored contact lenses, to major cosmetic surgery. Many techniques, such as microdermabrasion and chemical or physical peels, remove the oldest, top layers of skin cells. The younger layers of skin left behind appear more plump, youthful, and soft. Permanent application of pigments (tattooing) is also used cosmetically. Broadway actor Jim Brochu applies makeup before the opening night of a play. While there is assurance from the largest cosmetic companies that their various ingredients are safe, there is a growing preference for cosmetics that are without any "synthetic" ingredients, especially those derived from petroleum. Once a niche market, certified organic products are becoming more mainstream. Ingredients' listings in cosmetics are highly regulated in many countries. The testing of cosmetic products on animals is a subject of some controversy. It is now illegal in the United Kingdom, the Netherlands, and Belgium, and a ban across the European Union is due to come into effect in 2009. Cosmetics ingredients come from a variety of sources but, unlike the ingredients of food, are often not considered by most consumers. Cosmetics often use vibrant colors that are derived from some unexpected sources, ranging from crushed insects to rust. Many new techniques have allowed manufacturers to synthesize such colors and the use of animals (or parts thereof) has been declining for many years. Cosmetics in a variety of forms date back to early civilizations, with the need to improve ones personal appearance being an important factor in attracting a mate. Over the years, the ingredients have changed dramatically as we discovered how to manufacture our own scents and cosmetic formulae. The realization of the dangers of many common ingredients also greatly impacted the growing industry. Ancient Egyptian aristocracy made use of minerals to provide color and definition to their facial features. During the era of the Greek Empire, it was common to use face paints, while the Romans indulged in baths containing oil-based perfume. Clay is one of the most common ingredients found to benefit the skin, possibly due to the minerals that are released.It was reported that Cleopatra used mineral-rich black muds from the Dead Sea. Cerebrosides (cells from the nervous systems of cattle or swine) were once used in some high-end skin-care products to increase moisture retention and to create a smooth skin surface. However, the Bovine Spongiform Encephalopathy (BSE) controversy has put an end to this practice. Strong red colors for eye products have been produced using the dye carmine, made from carminic acid extracted from the crushed bodies of the cochineal insect. Carmine was once the only bright red color permitted by the FDA for use around the eye. Lipstick is known to have been used around 5000 years ago in ancient Babylon, when semi-precious jewels were crushed and applied to the lips and occasionally around the eyes. Ancient Egyptians extracted purplish-red dye from fucus-algin, 0.01 percent iodine, and some bromine mannite, which resulted in serious illness. Cleopatra had her lipstick made from crushed carmine beetles, which gave a deep red pigment, and ants for a base. The red color of modern lipstick can come from synthetically derived pure iron oxide (one of the components of rust), however most leading brands use the more economical synthetic colors. In the United States, every batch of synthetic dye and pigment must have a sample sent to the U.S. FDA for testing and certification that the batch is pure and its contaminants are below the levels specified by law. Synthetic colors are listed in the ingredients as a code (for example, F&D red no 6) and may contain up to 10 parts per million of lead / 3 parts per million of arsenic. There is some controversy over the presence of these trace ingredients, especially since makeup worn on the lips is not just absorbed through the skin, but also swallowed with drinking and eating. Because lowering these levels would make the production and sale of practically all lipstick illegal, and because the FDA has determined that the existing levels are safe, the cosmetic industry continues to produce and sell lipstick. Typically, the pigment is crushed very finely (7 to 10 micrometers) while being mixed with castor oil and is then mixed with a wax base to form a finished lipstick. Lipsticks may be sheer or dense, matte or shiny. In their thinnest and most fluid consistency, they are given their own category, lipgloss. The Crusaders brought alcohol-based perfumes back to Europe from the Middle East in the thirteenth century. The first modern perfume, made of scented oils blended in an alcohol solution, was made in 1370 at the command of Queen Elizabeth of Hungary and was known throughout Europe as Hungary Water. France quickly became the European center of perfume and cosmetic manufacture, cultivating vast amounts of flowers for their essence. By the eighteenth century, aromatic plants were being specifically grown in the Grasse region of France to provide the growing perfume industry with raw materials. Perfume had been used to mask body odor for many hundreds of years, but in the late 19th century the ability to reduce such odor was developed. The original active ingredient of antiperspirants was aluminum chloride but complaints of skin irritation led to the increased use of aluminum chlorohydrate as an alternative. Aluminum has been established as a neurotoxin and has been shown to adversely affect the blood-brain barrier, cause DNA damage, and have adverse epigenetic effects. Research has shown that the aluminum salts used in antiperspirants have detrimental effects on a number of species such as non-human primates, mice, dogs, and others. An experiment with mice found that applying an aqueous solution of aluminum chloride to the skin resulted in "a significant increase in urine, serum, and whole brain aluminium." Other experiments on pregnant mice showed transplacental passage of aluminum chloride. Legislation varies from country to country but most countries have some sort of formal legislation that either restrict or prohibit certain ingredients or products. There are two main sources for cosmetics safety: the EU Cosmetics Directive 76/768/EEC and the Canadian Cosmetic Ingredient Hotlist. Cosmetic colorants are highly regulated. In the United States, the regulating body is the Food and Drug Administration. Each country or group of countries has their own regulatory agency that controls what can go into cosmetics. Many colorants in cosmetics are also used as food dyes. The popularity of cosmetics in the twentieth century has increased rapidly. Especially in the United States, cosmetics are being used by girls at a younger and younger age. Many companies have catered to this expanding market by introducing more flavored lipsticks and glosses, cosmetics packaged in glittery, sparkly packaging and marketing and advertising using young models. The social consequences of younger and younger beautification has had much attention in the media over the last few years. Criticism of cosmetics has come from a variety of sources, including feminists, animal rights activists, books, and public interest groups. There is a growing awareness and preference for cosmetics that are without any toxic ingredients, especially those derived from petroleum, SLS, and parabens. Synthetic fragrances are widely used in consumer products. Studies concluded from patch testing, show synthetic fragrances are made of many allergic reaction ingredients. One potential danger is the use of old mascara. Some mascaras contain an ingredient that breaks down to produce formaldehyde. The formaldehyde prevents the growth of bacteria. Aged mascara, however, may no longer be producing formaldehyde, allowing bacteria to proliferate. For this reason, it is often recommended to replace a tube of mascara every few months. ↑ 1.0 1.1 1.2 1.3 1.4 1.5 1.6 1.7 1.8 1.9 Sandra I. Reed, 2004. Cosmetics and Your Health. US Department of Health and Human Services. Retrieved September 11, 2007. ↑ Carol Lewis, 2000. Clearing up Cosmetic Confusion. FDA. Retrieved September 11, 2007. ↑ Rita Johnson, 1999. What's that Stuff? Chemical & Engineering News. Retrieved September 11, 2007. ↑ Kohl, Kajal, Al-Kahl, or Surma: By Any Name, Beware of Lead Poisoning. U.S. Food and Drug Administration. Retrieved July 16, 2008. ↑ Hillary Mayell, for "National Geographic News", January 12, 2004. As Consumerism Spreads, Earth Suffers, Study Says. National Geographic online. Retrieved September 11, 2007. ↑ Clay: The Medicinal and Cosmetic Benefits.ountainrose herbs.Retrieved July 16, 2008. ↑ ICOA Technical Bulletins - Effect on Skin. International Caster Oil Association. Retrieved September 11, 2007. ↑ 8.0 8.1 Cecil Adams, 2000. Does lipstick contain fish scales?. straightdope.com. Retrieved September 11, 2007. ↑ Roman cosmetic secrets revealed.3 November, 2004, BBC News. Retrieved September 11, 2007. ↑ Rita Johnson,. 1999. What's That Stuff? - Lipstick." Chemical and Engineering News. Retrieved September 11, 2007. ↑ Federal Food, Drug and Cosmetic Act; Chapter VII—General Authority; Subchapter B—Colors. LISTING AND CERTIFICATION OF COLOR ADDITIVES FOR FOODS, DRUGS, AND COSMETICS. U.S. Food and Drug Administration. Retrieved July 16, 2008. ↑ Code of Federal Regulations, Title 21, Volume 1 -FOOD AND DRUGS, CHAPTER I—FOOD AND DRUG ADMINISTRATION, DEPARTMENT OF HEALTH AND HUMAN SERVICES, PART 74—LISTING OF COLOR ADDITIVES SUBJECT TO CERTIFICATION. ↑ Color Additives: FDA's Regulatory Process and Historical Perspectives. U.S. Food and Drug Administration. Retrieved July 16, 2008. ↑ 15.0 15.1 Lydia Boyd,Brief History of Beauty and Hygiene Products.Scriptorium, Duke University Libraries. Retrieved September 11, 2007. ↑ Aluminum-induced neurotoxicity: alterations in membrane function at the blood-brain barrier. NCBI PubMed. Retrieved September 11, 2007. ↑ A comet assay study reveals that aluminum induces DNA damage and inhibits the repair of radiation-induced lesions in human peripheral blood lymphocytes. NCBI PubMed. Retrieved September 11, 2007. ↑ Alterations in lipid composition and neuronal injury in primates following chronic aluminium exposure." NCBI PubMed. Retrieved September 11, 2007. ↑ 19.0 19.1 Transplacental passage of aluminium from pregnant mice to fetus organs after maternal transcutaneous exposure. NCBI PubMed. Retrieved September 11, 2007. ↑ Rapid Communications: Antiperspirant Induced DNA Damage in Canine Cells by Comet Assay. NCBI PubMed. Retrieved September 11, 2007. ↑ Bioaccumulation of water-soluble aluminium chloride in the hippocampus after transdermal uptake in mice. NCBI PubMed. Retrieved September 11, 2007. ↑ Consolidated version of Cosmetics Directive 76/768/EEC. Enterprise and Industry, European Commission. Retrieved July 16, 2008. ↑ List of Prohibited and Restricted Cosmetic Ingredients (The Cosmetic Ingredient "Hotlist"). Health Canada. Retrieved July 16, 2008. ↑ Signers of the Compact for Safe Cosmetics. Campaign for Safe Cosmetics. Retrieved September 11, 2007. ↑ Agner T. 1991. Susceptibility of atopic dermatitis patients to irritant dermatitis caused by sodium lauryl sulphate. Acta Derm Venereol. 71:4:296-300. ↑ A. Nassif, S. C. Chan, F. J. Storrs and J. M. Hanifin. 1994. Abstract: Abnormal skin irritancy in atopic dermatitis and in atopy without dermatitis. Arch Dermatol. 130:11:1402. Retrieved September 11, 2007. ↑ S. Marrakchi, H.I. Maibach. 2006. Sodium lauryl sulfate-induced irritation in the human face: regional and age-related differences. Skin Pharmacol Physiol. 19 (3):177-180. ↑ CIR publication. 1983. Final Report on the Safety Assessment of Sodium Lauryl Sulfate and Ammonium Lauryl Sulfate. Journal of the American College of Toxicology 2 (7): 127-181. ↑ H. Loffler, Effendy I. 1999. Skin susceptibility of atopic individuals. Department of Dermatology, University of Marburg, Germany. Contact Dermatitis. 40(5): 239-242. ↑ J. Nagel, J.T. Fuscaldo, P. Fireman. 1977. Paraben allergy. JAMA. 237:15:1594-5. ↑ J.R. Byford, L.E. Shaw, M.G. Drew, G.S. Pope, M.J. Sauer, P.D. Darbre. 2002. Oestrogenic activity of parabens in MCF7 human breast cancer cells. J Steroid Biochem Mol Biol. 80 (1):49-60. ↑ Patch testing with fragrances: results of a multicenter study of the European Environmental and Contact Dermatitis Research Group with 48 frequently used constituents of perfumes. Contact Dermatitis. Retrieved September 11, 2007. ↑ "FDA/CFSCAN Cosmetics—Shelf Life - Expiration Date". FDA. Retrieved September 11, 2007. Byers, Dorie. 2001. Natural Beauty Basics: Create Your Own Cosmetics and Body Care Products. Ridgefield CT: Vital Health Publishing. ISBN 1890612197. Michalun, Natalia and Varinia Michalun. 2000. Skin Care and Cosmetic Ingredients Dictionary. (Delmar Cengage Learning) Clifton Park, NY: Milady. ISBN 1562536605. Winter, Ruth. 2005. A Consumer's Dictionary of Cosmetic Ingredients: Complete Information About the Harmful and Desirable Ingredients in Cosmetics. New York, NY: Three Rivers Press/Random House. ISBN 1400052335. This page was last modified on 24 June 2013, at 14:35.